Last week Ovum and @SarahBurnett were kind enough to invite me to speak at their Business Intelligence Masterclass in London. Unfortunately one of the Ovum presenters, Madan Sheina, was ill, but Sarah did a great job running the session. The set up of the room and the number of delegates both encouraged interaction and there was a great atmosphere with lots of questions from the attendees and some interesting exchanges of ideas. Work commitments meant that I had to leave after lunch, which was a shame as I am sure that – based on what I saw in the morning – the afternoon workshops sessions would have been both entertaining and productive. 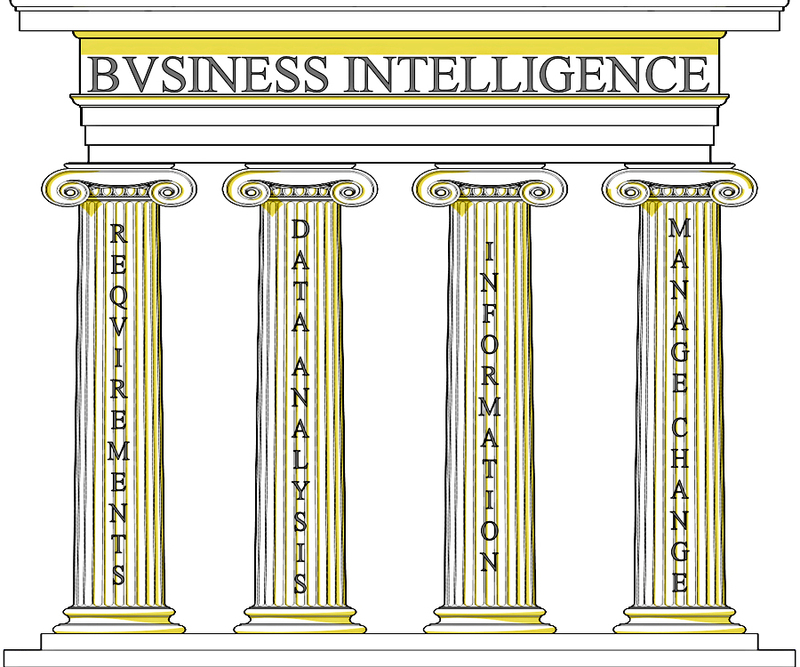 I certainly enjoyed my presentation – on Initiating and Developing a BI Strategy – which focussed on both my framework for success in Business Intelligence and, in particular, addressing the important cultural transformation aspects of these. Thank you also to the delegates both for the questions and observations and for kindly awarding my talk an 83% rating via the now ubiquitous seminar questionnaire. As part of my section on change management, I covered some of the themes that I introduced in my article Perseverance. 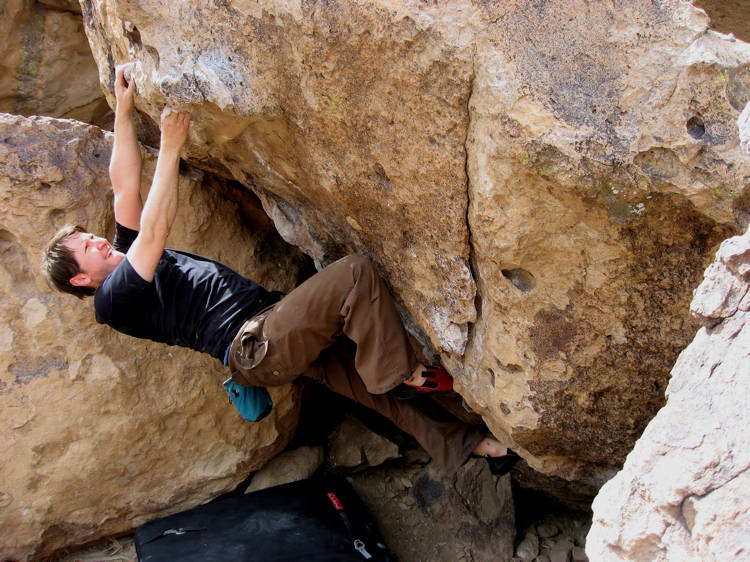 In this I spoke about one of the types of rock climbing that I enjoy; bouldering. 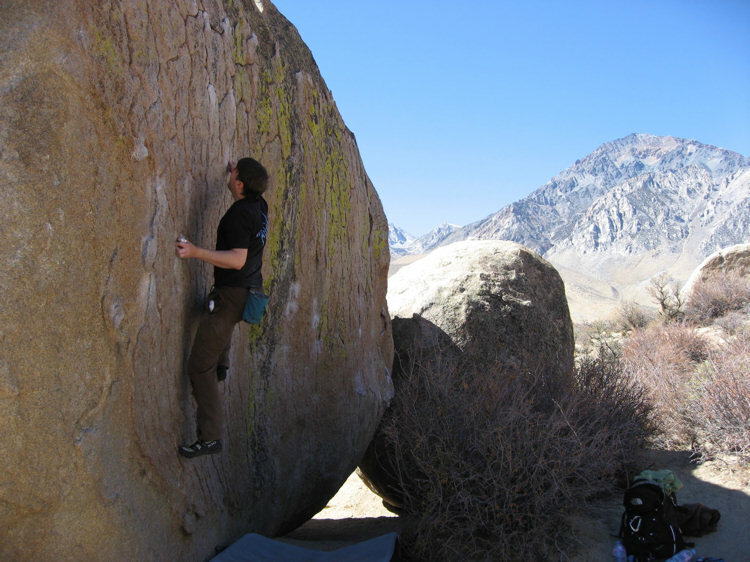 Bouldering is regular rock climbing on steroids, it is about climbing ultra-hard, but short climbs; often on boulders – hence the name. I compared the level of commitment and persistence required for success in bouldering to the need for the same attributes in change management initiatives. I spoke to a few different delegates about this analogy during a coffee break. One in particular came up with an interesting expansion on my rock climbing theme. He referred to how people engaged in mountaineering and multi-pitch rock climbing make progress in a series of stages, establishing a new base at a higher point before attempting the next challenge. He went on to link this to making incremental progress on IT projects. I thought this was an interesting observation and told the gentleman in question that he had provided the inspiration for a future blog article. The above video is excerpted from the introduction to Hard Grit a classic 1998 climbing film by Slackjaw productions. It features climbing on the Gritstone (a type of hard sandstone) edges of the UK’s Peak District. This famous sequence shows a pretty horrendous fall off of a Peak District test piece called Gaia at Black Rocks. Amazingly the climber received no worse injuries than a severely battered and lacerated leg. Despite its proximity to my home town of London, Gritstone climbing has never been my cup of tea – it is something of an acquired taste and one that I have never appreciated as much as its many devotees. As an aside you can see a photo of a latter-day climber falling off the same route at the beginning of my article, Some reasons why IT projects fail. I’m glad to say in this photo, unlike the video above, the climber is wearing a helmet! What the clip illustrates is the dangers inherent in the subject of this article; traditional lead climbing. OK the jargon probably needs some explanation. First of all climbing is a very broad church, in this piece I’ll be ignoring whole areas such as mountaineering, soloing and the various types of winter and ice climbing. I am going to focus on roped climbing on rock, something that generally requires dry weather (unless you are a masochist or the British weather changes on you). Single-pitch climbs are shorter than a length of rope (typically 50-70m) and often happen on rock outcrops such as in the Peak District mentioned above. The climber completes the climb and then the belayer may follow them up if they want, or alternatively the climber might walk round to find an easy decent and the pair will then go and find another climb. Multi-pitch climbs consist of at least two pitches; and sometimes many more. They tend to be in a mountain environment. One person may climb a pitch and then alternate with their partner, or the same person may climb each section first. It depends on the team. Top roping is not a very precise term (bottom roping might be more accurate) but is generally taken to mean that the rope runs from the belayer, to the top of the climb and then down to the climber. As the climber ascends, the belayer (hopefully!) takes in the slack, but (again hopefully!) without hauling the climber up the route. This means that if the climber falls (and the belayer is both competent and attentive) they should be caught by the rope almost immediately. Obviously this arrangement only works on single-pitch climbs. In lead climbing, or leading, the rope runs from the belayer up to the climber. As the climber ascends, they attach the rope to various points in the rock on the climb (for how they do this see the next bullet point). Assuming that the climber is able to make a good attachment to the rock (again see next point) the issue here is how far they fall. If they climb 2m above their last attachment point, then a slip at this point will see them swinging 2m below this point – a total fall of 4m, much longer than when top roping. Also if the last attachment point is say 10m above the ground and the climber falls off say 8m above this, then slack in the system and rope stretch will probably see them hit the ground; something that should never happen in top roping. sport / traditional In the last point I referred to a lead climber mysteriously attaching themselves to the rock as they ascend. The way that they do this determines whether they are engaged in sport or traditional climbing (though there is some blurriness around the edges). In sport climbing, holes are pre-drilled into the rock at strategic intervals (normally 3-5m apart, but sometimes more). Into these are glued either a metal staple or a single bolt with a metal hanger on it that has a hole in it. The process of equiping a sport route in this way can take some time, particularly if it is overhanging and of course it needs to be done well if the bolts are to hold a climber’s fall. A single-pitch sport climb may have 10 or more of these bolts, plus generally a lower-off point at the top. The climber will take with them at least the same number of quick draws as there are bolts. These are two spring-loaded carabiners joined by a section of strong tape. As the climber ascends, they clip one end of a quick-draw to the staple or hanger and the other end over the rope attaching them to their belayer. So long as the person who drilled and inserted the bolts did a good job and so long as the climber is competent in clipping themselves into these; then sport climbing should be relatively safe. At this point I should stress that I know of good climbers who have died sport climbing, often by making a simple mistake, often after having completed a climb and looking to lower off. Sport climbing is a relatively safer form of climbing, but it is definitively not 100% safe; no form of climbing is. 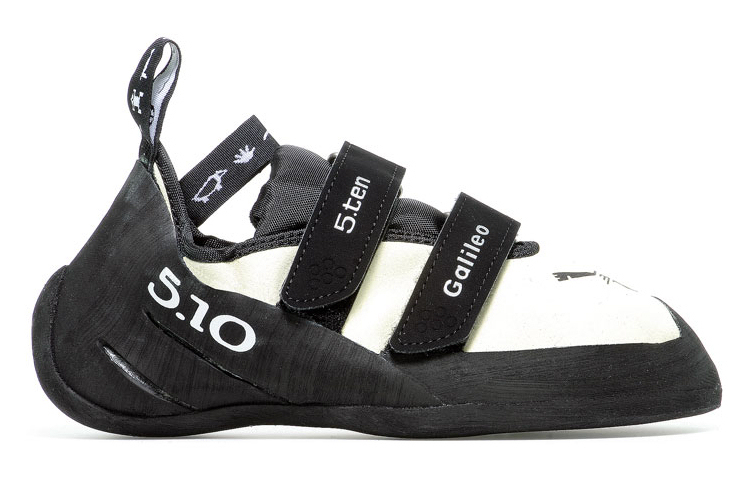 Because of its [relative] safety, sport climbing has something of the ethos of bouldering, with a focus on climbing at your limit as the systems involved should prevent serious injury in normal circumstances. Once you have secured any of the above into or around the rock, you clip in with a quick-draw as in Sport climbing and heave a sigh of relief. In the video that started this section, Jean-minh Trin-thieu falls (a long way) on to a cam, which thankfully holds. The issue on this particular climb is that there are no more opportunities to place gear after the final cam at round about half-way up. The nature of the rock means that a lot of Gritsone climbing is like this; one of the reasons that it is not a favourite of mine. In any case, having established the above dimensions, I am going to drill down via two of them to concentrate on just trad leading. My comments apply equally to multi- and single-pitch, but the former offers greater scope for getting yourself into trouble. One of the major issues with trad climbing, particularly multi-pitch trad climbing in a mountain environment is that you are never quite sure what you need to take. The more gear you clip to your harness, the more likely you are to be able to deal with any eventuality, but the heavier you are going to be and the harder it will be to climb. Some one once compared trad leading to climbing wearing a metal skirt. The issue here is that not only do you have to find somewhere to place this protective gear, you have to place it well so that it is not dislodged as you climb past, or pulls out if you fall. What adds to this problem is that you may have to try to place say a wire in a situation where you are holding on to a small hold with one hand, with only one foot on a hold and the other dangling. You may also be on an overhang and thus with all gravity’s force coming to bear on your tendons. At such moments thoughts like “how far below was my last piece of gear?”, “how confident am I that I placed it well?” and “what happens if I can’t fiddle this piece of metal into this crack before my fingers un-peal?” tend to come to mind with alarming ease. It is not unheard of for a trad leader to climb up many metres, placing an assortment of gear en route, only to fall off and have all of it rip out, a phenomenon call “unzipping”, thankfully not something I have experienced directly; though I have seen it happen to other people. These additional uncertainties tend to lead to a more cautious approach to trad leading, with many people climbing within their abilities on trad climbs. Some people push themselves on trad and some get away with it for a while. However there is a saying about there being old climbers and bold climbers, but no old bold climbers. I have written quite a few times before about the benefits of an incremental approach, so long as this bears the eventual strategic direction in mind (see for example: Tactical Meandering and Holistic vs Incremental approaches to BI). In rock climbing, even within a single pitch, it is often recommended to break this into sections, particularly if there are obvious places (e.g. ledges) where you can take a bit of a rest and consider the next section. This also helps with not being too daunted; often the biggest deal is to start climbing and once you are committed then things become easier (though of course this advice can also get you in over your head on occasion). Splitting a climb into sections is a good idea, but – in the same way as with business projects – you need to keep your eye on your eventual destination. If you don’t you may be so focussed on the current moves that you go off route and then have to face potentially difficult climbing to get back where you need to be. The equivalent in business would be projects that do not advance the overall programme. However the analogy doesn’t stop there. If we break a single-pitch trad lead climb into smaller sections, those between each piece of gear that you place, then it is obvious that you need to pay particular attention to the piece of equipment that you are about to employ. If you do this well, then you have minimised the distance that you will fall and this will bolster your confidence for the next piece of climbing. If you rush placing your gear, or assume that it is sort of OK, then at the best you will give yourself unnecessary concerns about your climbing for the next few metres. At worst a fall could lead to this gear ripping and a longer fall, or even hitting the ground. In business projects, if you take an incremental approach, then in the same way you must remember that you will be judged on the success or failure of the most recent project. Of course if you have a track record of earlier success then this can act as a safety net; the same as when your highest piece of gear fails, but the next one catches you. However, it is not the most comfortable of things to take a really long leader fall and similarly it is best to build on the success of one project with further successes instead of resting on your laurels. 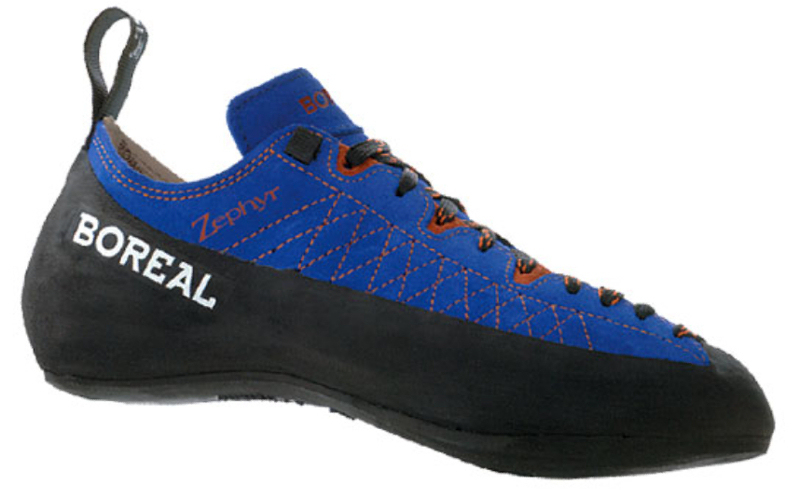 Of course the consequences of rushing your interim steps in rock climbing can be a lot more terminal than in business. Nevertheless failure in either activity is not welcome and it is best to take every precaution to avoid it. This blog is generally focused on topics in business, technology and change; often all three at the same time. However, from time to time, a personal post leaks in. This is one such post… or is it? Read to the end and then I will leave you to make up your own mind about this question. Over the years I have played many sports. For example, both cricket and rugby union consumed much of my youth. I have also recently got into mountain biking and really enjoy it. However, the activity that I am most engaged in currently is rock climbing, something that I alluded to at the beginning of a blog post yesterday. Rock climbing forms a very broad church and I have taken part in many aspects of it. However, for a number of reasons, I have gravitated to the sub-genre of bouldering over the last few years. The whole point is that, because bouldering is relatively (and I stress the word relatively) safe, you can try to make moves that are at the limit of your ability; moves that would not be terribly sensible to even contemplate making on a longer, higher, roped climb. In fact bouldering climbs are so difficult that they are generally described as “problems”; an apt name that also conveys the fact that sometimes you have to use extreme subtlety and finesse as well as brute strength to get up them. People often literally spend years attempting to complete a problem, particularly if it represents a new level of climbing for them, or if no one else has climbed the line before. 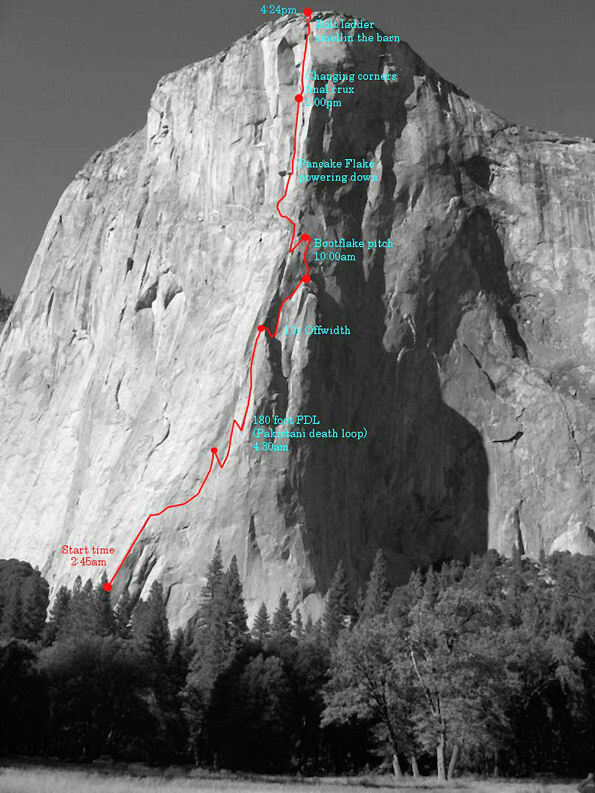 Because of this, such unclimbed lines are often called projects. It’s common to ask a fellow climber about how their current project is progressing. This choice of name perhaps begins to give some indication of why I am sharing my experiences in bouldering with you today. Having said that most boulder problems are short, some hardy souls also embrace high-ball bouldering which, as the name suggests, takes you a lot further off the ground. The following video shows one of the world’s best climbers, Chris Sharma, bouldering in Bishop, California. It segues to him and another top climber, Ethan Pringle, attempting a high-ball problem that weighs in at around 11-12m (35-40 ft). Note 1: Ethan issues an expletive under his breath towards the end of the clip. I might well have been tempted to do so myself in similar circumstances, but count yourselves warned. Note 2: As will be apparent if you try to click on this video, it is sadly no longer available, probably to do with copyright issues. 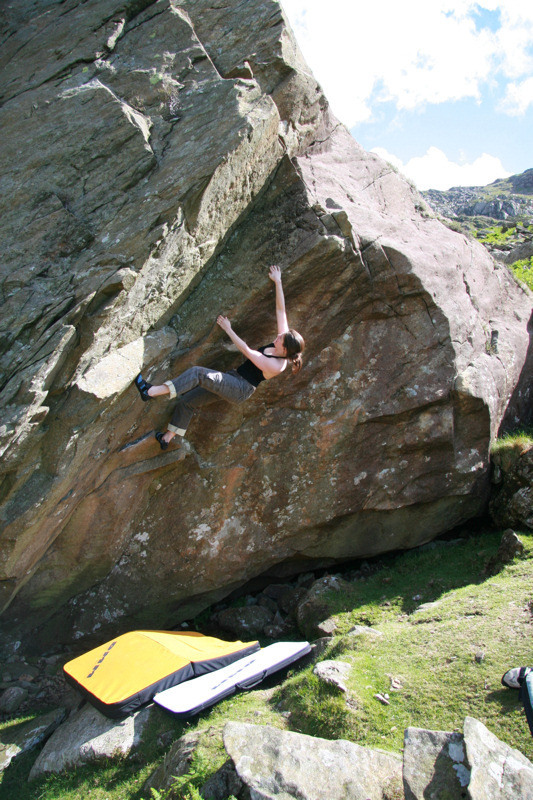 Instead I would recommend that you take a look at the bouldering section of Dead Point Magazine’s site. Copyright notice. This piece is taken from the DVD King Lines which features Chris Sharma climbing all over the world. The copyright holder is BigUp Productions, a world-renowned and award-winning producer of climbing DVDs. So what does this have to do with the price of fish? I have recently taken to showing the above photograph at the mid-point of my public speaking about business intelligence and change management. Generally I have introduced it with the comment that I wanted to relieve the audience’s boredom by showing them some of my holiday snaps. 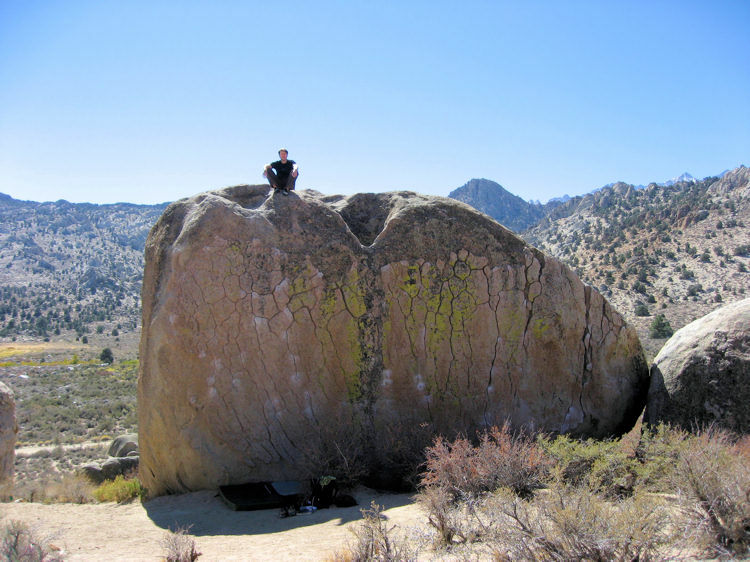 As in the above video, this climb is also in Bishop, California, a world-class bouldering venue. The problem is called Green Wall Essential and its grade of difficulty is V2. Without going into enormous detail about the different grading systems for boulder problems, I’ll simply say that V2 is towards the easier end of the spectrum; V15/16 is the hardest that people have climbed. I mentioned the term project above; Green Wall Essential became my project and my obsession. The above statistics represent more effort than I have ever put into climbing anything else. The quartz monzonite rock is hard and crystalline. It digs into your fingers and peels off your skin leaving the rock stained with your blood (you can see the tape holding the tips of my fingers together in the photograph). Your muscles and tendons ache from trying to push yourself just that little bit harder in order to attain success. You endlessly try different foot holds and body positions. You try to be slow and precise. When that doesn’t work you try to be aggressive and dynamic. When that doesn’t work… and so on and so on. Now in order to put in that much effort over that much time, and to put up with that much pain and that much failure, you have to really want to do the problem. You have to be persistent, despite set backs. You have to continue to keep a positive mind-set, to believe that you can be successful, even when you have just failed for the 80th time. In my experience, that is precisely the same mind-set that you need to be successful with major projects, particularly in the business of change management. Hopefully your fingers will bleed less, but it will not be easy. There will be set-backs. Progress may sometimes seem glacially slow, but if you persevere then the goal is worth it. Sometimes we want to find a magic recipe for success, or – to mix the metaphor – a silver bullet. We want to discover a series of defined steps to take that, if repeated religiously, will guarantee that we get to the desired goal each and every time. That’s why articles entitled “The 5 ways to […]” and “My top tips for […]” are so well-read on the web. My take is that the secret ingredient may be very simple: plain, pig-headed perseverance. By way of illustrating the benefits of this approach (and closing this article), here I am having achieved my own personal goal on Green Wall Essential… EVENTUALLY!!! Me a very happy boulderer having completed my project. I wish you luck with your own projects, be these in business intelligence, other areas of IT, change management, or even bouldering. My own “Top tip” – if at first you don’t succeed, persevere. 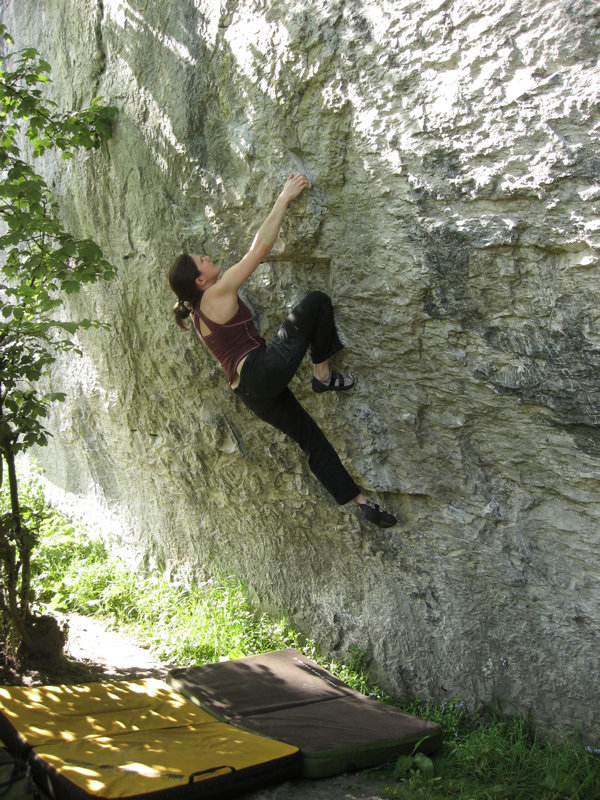 If I have whetted anyone’s appetite about bouldering, you can take a look at my partner’s bouldering blog, which contains bouldering photos and videos, together with her musings on what motivates her to climb.